Mignonette is a do-it-yourself electronic game console to learn about soldering, microcontrollers, and game programming. It is also a lot of fun! Our design was inspired by the Mignon Game Kit that was done in Germany several years ago. We extend upon their wonderfully simple design to include a bicolor display, as well as a completely new software library for making games. Check the links below for assembly instructions, documentation, contributed games and source code. We have released Version 2.1 of the Mignonette Game! 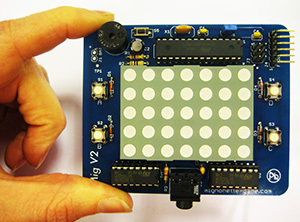 It features the same microcontroller that is used in the Arduino Uno. We are updating our website with more information on this new version. Feel free to contact us if you have any questions or suggestions.